Our story began in 1971 when we met and became high school sweethearts. After four years of dating we were married, and we resided in western Illinois and eastern Iowa for ten years before transferring to Dallas, Texas for career advancement opportunities. We loved to travel, and I (Nancy) was very fortunate to have a career that provided me the opportunity to travel throughout the country on a weekly basis. Steve often joined me for weekend travel excursions, and we frequently sought out bed and breakfasts for the social interactions they offered. We also enjoyed collecting antiques and ‘making old things new again,’ and in 1998 we took on the challenge of restoring an 1895 Queen Anne Victorian home in Waxahachie, Texas, a small historic town 30 miles south of Dallas. The project was a labor of love, and we were proud of the transformation of the home into a beautiful ‘painted lady,’ complete with five different colors of paint. While we lived in Waxahachie, I dabbled in retail sales in an antique shop in the historic downtown area. I realized that I enjoyed the retail business, so when Steve and I sold our ‘painted lady’ in 2003 and moved back to Iowa in 2004 to be closer to our families, we began to look for a property where we could have both a residence and retail shop. We found such a property in Winterset, Iowa, a small historic town much like Waxahachie, Texas. We loved the idea of small town living while still being within 30 miles of a larger metropolitan area (Des Moines). We had the good fortune of finding a wonderful property for sale, a former church building within walking distance of the historic Winterset town square. 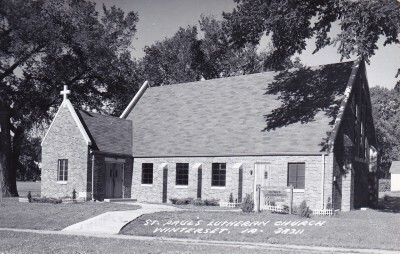 The church was built in 1949 and expanded in 1986, with the addition of a fellowship hall. In 2005 we purchased the building and converted the fellowship hall into our personal residence. One year later we opened a retail shop, Heavenly Habitat, in the lower level where the Sunday school classes were once taught. Because the church provided much more space than we actually needed for our residence and retail space, we realized we had a great opportunity to open a Bed and Breakfast. In October 2009, we moved into our new separate living quarters in the original sanctuary of the building, and Heavenly Habitat Bed and Breakfast was opened in the former fellowship hall. 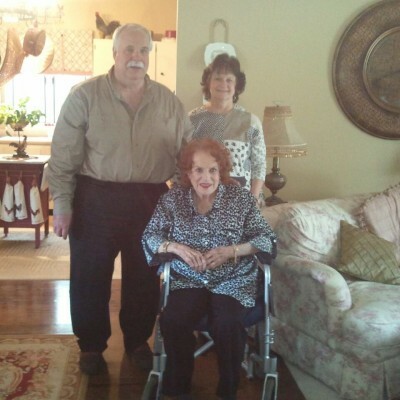 One of the most memorable experiences of our bed and breakfast ownership to date was in May of 2013, when we had the opportunity to host legendary film actress Maureen O’Hara. She was here in Winterset for the occasion of the John Wayne Birthday Celebration that year, and she was the highlight of the event. Most of her entourage stayed at another large home nearby, and she stayed at Heavenly Habitat, along with her caregiver and great-granddaughter. In fact, she spent most of her time here, except for brief public appearances. It was comfortable for her because of our open floor plan and wheelchair accessibility. She was a wonderful conversationalist, and we enjoyed hearing stories that she remembered about working with John Wayne and his cohorts 40 and 50 years ago. It was our great pleasure to have her here, and we will never forget it. Just ask, and we’ll tell you if you’re sleeping in the same room where Maureen O’Hara once stayed!